The New Moon on 6/13/2018 at 3:43 PM ET set for Washington DC creates a specific tone for this lunar cycle… With this New Moon I hear Yo-Yo Ma*. All New Moons have their own resonance, along with the vibratory pitch of welcoming a fresh start. A New Moon invites a few cycles of new beginnings; one is the 28 day lunar cycle, as it waxes toward the full moon and then wanes to the next new moon. The other cycle is Gemini New Moon to the next year’s in that sign, which of course is a greater journey of intentions. Where does Gemini fall in your personal horoscope? When you clock how the new moons travel through the areas of your life (houses), you gain insight as to your personal evolution. Most people think in terms of the 28 day cycle, unless they feel an allegiance to the sign of the moon. Regardless of whether or not a person is aware of these cycles, they happen and have an effect. Think of what life would be like for a blind person who structured their life with no awareness of the cycles of day and night. That person could craft an existence with no attention to light, but would nonetheless be influenced by its cycle. When we pay attention to the lunar cycle, we work in tandem with the flow of existence rather than counter to it. People who find the lunar calendar especially helpful have strong placements of the sign of Cancer or the Moon in their horoscope, although everyone benefits from working with cycles. 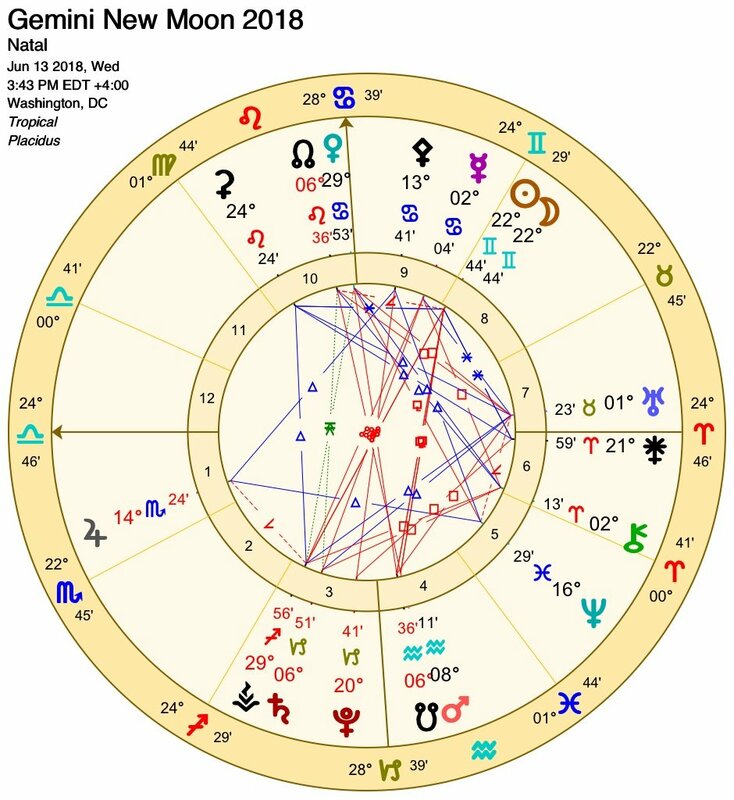 This Gemini Moon on 6/13/2018 at 3:43 PM ET for Washington DC sits in the 8th house of transformation and mergers. It is the spark of new beginnings after the Singapore Summit. The Moon makes no other aspect after its conjunction with the Sun. The New Moon is colored by Taurus, the gatekeeper of the 8th in this horoscope, as well as the Libra Ascendant, which brings us to Venus at the midheaven. She is in Cancer at 29°, considered a critical degree. This is a “degree of fate,” often considered negative. The negative interpretation is because there’s a destiny edge to this point; as though whatever has happened cannot be undone. Positioned at the midheaven, Venus indicates that steps taken over the next lunar cycle are inevitable. Venus has to do with finances, investments and any economist will tell you there are trackable cycles with the markets. This is mirrored by Jupiter/Saturn cycles in astrology and yet, there are deeper forces at play now as the world financial structure is up for a new economy (Pluto in Capricorn). In the sign of Cancer, Venus brings us back to the Moon with her 8th house secrets. We cannot know the agendas of all players on the financial stage, but we can be aware of our own motivation. Finances are actually the product of what a society’s emotional investment and values are. At present our financial structures do not support sustainable economies. Sustainable economies allow growth without depleting resources: human, cultural, environmental, etc. At this New Moon, the more invested you are in change, the greater your impact. The Moon reflects the mood of the people and all signs indicate transformation is happening, whether or not they want the change that’s coming. More clarity is found through Mercury, the planet associated with Gemini. It too is in the sign of Cancer, but unlike Venus, it shows a work in progress, not a fait accompli. Mercury has made a harmonious aspect with Uranus in the 7th; unprecedented reactions from allies and enemies may have occured. Yet whatever has led up to this new start has an inevitable feel to it, because you cannot stop a power of this force. Mercury is in the 9th house of foreign countries and judicial affairs. It is opposed by Saturn in Capricorn in the 3rd house of communication- demanding accountability and by the book translation. A T-square with Chiron in the 6th brings in the people’s wounds. Are they being served by any negotiations? Does something need to shift to cement a strong foundation for your most valuable investment? Can you articulate what that investment is — what matters most to you? This Gemini New Moon encourages heartfelt acknowledgment. Claim the authority of your voice. 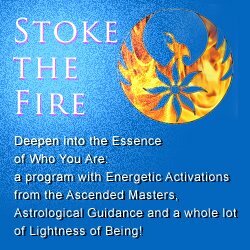 Is there something that feels complete or outworn that might be in your way of stepping forward? Send it off with recognition for what it’s taught you. Whether or not you are a writer, tease out your thoughts over the next few days, via a journal, blog or quick notes. Release the ideas and give them form. *One of my favorite true stories happened in 1999 when Yo-Yo Ma forgot his Montagnana cello in the trunk of a taxi one night after a Carnegie Hall concert. With the receipt from his ride, the police tracked it down at a garage in Queens in time for his evening concert. Ma said: “Somehow magic happened, and I have my cello”. Although it wasn’t a New Moon that night, magic can happen at a New Moon – make it happen for you.